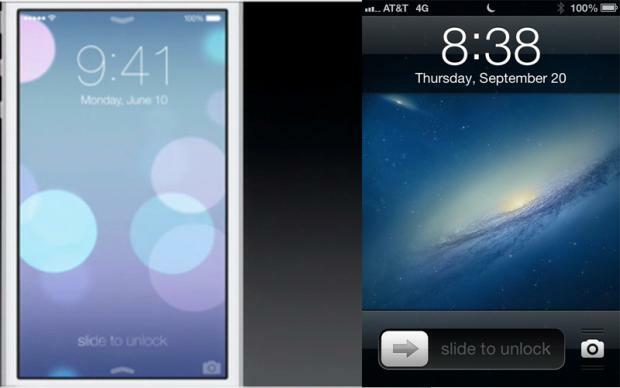 Are Apple engineers copy cats and will they face Patent Infringement or was it just inspiration, lets find out! The iOS 7 has been announced and Apple engineers have done a great job with the new interface but the fact remains that iOS 7 has heavily borrowed ideas from Android and Windows Phone. In the intensely competitive world OS, change is a arbritary must, or you go the Symbian way. And for that reason Apple engineers have done a very good job of keeping the entire iOS experience consistent with the new UI. The Lock Screen : Borrowed from Android and heavily too. The new lock screen in iOS 7 will now have a slider at the bottom of the screen, which you have to pull up to unlock the phone. The engineers are further influenced by Android for the new Notification Center. The new Notification Center will now be visible right from the lock screen. This detailing is available in Android since Ice Cream Sandwich version. Control Center : The Control Center is similar as the TouchWiz, Sense UI and Optimus UI and almost all versions of Android have the quick toggle present. The Control Center in iOS 7 lets you access the most-commonly used settings viz. Bluetooth, Airplane Mode, Do Not Disturb and screen rotation and toggle the Wi-Fi on and off. The Control Center also allows users to adjust brightness and control the music player, and get to the torchlight, clock, calculator and the camera. Users can access the Control Center from anywhere on their phone with a swipe up from the bottom of the display which is a new idea. Multi-tasking : This is the area were Android devices scored heavily over Apple devices. Apple as of yet was unable to provide good multitasking options. But now with the Card Style UI which has been borrowed from WebOS. If you remember, the Android has a similar style of multitasking UI called the Recent Apps screen since its version 4.0. The iOS 7 has a big similarity with Windows Phone 7/8 only thing is that in Windows Phone users have to use a long-press on the back button to activate it. So it seems that the multitasking has been borrowed from 3 major sources, Android, WebOS and Windows Phone. The net addition in the multitasking front is the data management in low connectivity situation. Users can stifle, accelerate or kill a process depending on the connectivity available to them. Killing a App has has been made very easy with users having to swipe their cards upwards. Automatic updates : Another one of a Androids Google Play Store default features which was sorely missed by Apple iOS 6 users. For the updates the iOS 6 users had to go to the Apple Store to update an App manually and that too depended on connectivity issues. Now with iOS 7, Apple has brought about automatic update service. The new Photo App is, as I have already written in my previous blog, a 'Instagram' clone in all respects. Despite all the copying and inspirations, the iOS does have a unique Apple feel to it which users are often accustomed to. However how much technology of the above is Patented and how many suits Apple will face is a big big question for the Apple top honchos. Further it may keep the Apple lawyers busy for several years and earn them a nice packet. It all depends on how you look at a half filled glass, either the glass is half empty or half full is always your choice.